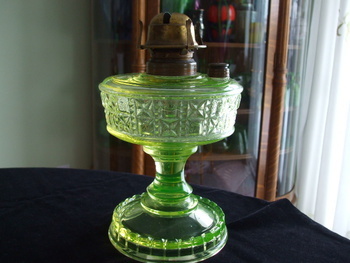 In Lamps > Oil Lamps > Show & Tell. 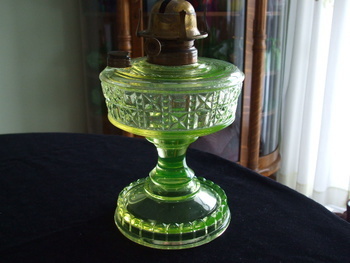 This lamp is not in any of the OIL LAMP Reference books but was said to have been made by the Adams & Company pre- 1891. 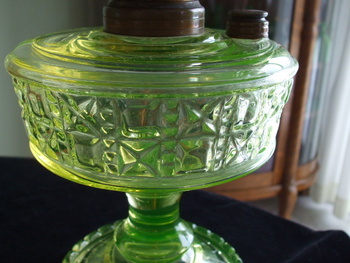 It is a large Vaseline Glass lamp that measures 7" wide by 8 3/4" tall (top of collar). The other unique aspect of this lamp is that it has a "picket Fence" base, a #3 collar and a filler hole on the top of the font. It is one of a few lamps made in Vaseline in my collection (accumulation). The burner is a #3 "QUEEN" made by the Manhattan Brass Company of N.Y.
very nice lamp but doesn't look like Valencia to me. It does look more like the Paragon pattern made by Adams & Co. in 1891 and later as U.S .Glass #15118. You're very welcome BOB. A very happy new year to you as well. I'm not really convinced on the USG attribution for Paragon either. Many of the EAPG era oil lamps were not really part of a pattern line. The one you have has some of the motifs from Paragon as well as Valencia Waffle, which does tend to agree with the Adams & Co. attribution, but it may not have actually been given a name. 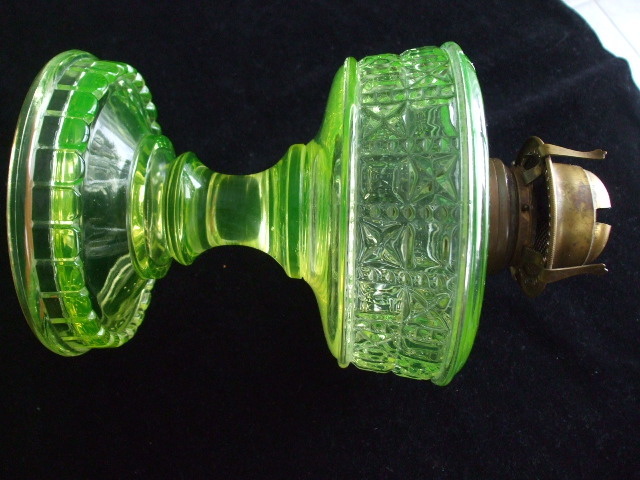 I found a few Paragon examples but not any really good images showing the detail; tho' the detail around the base of the Paragon caster set does look more like the foot on your lamp. The foot of all Valencia Waffle pieces that I've found were all square and had the same motifs as the body. I found it interesting that the link you provided mention this lamp as an unusual Block and Star pattern.